The Jurassic Period was the Age of the Dinosaurs. It began after the Triassic Period around 206 million years ago. It lasted until 144 million years ago, more than 60 million years in the middle of the Mesozoic Era. Pangea continued to split apart during the Jurassic. This caused volcanoes to erupt along the Tethys Sea floor where the rift between the continents began. On the ocean side of Pangea, the plates continued to collide. One plate was being forced under another. Folds, uplifts and volcano eruptions occurred along the moving plates. The mountains that stretch from British Columbia, through North America and into South America were beginning to form during this time. The climate was warm and stable. Many types of animals and plants developed. The numbers of different species increased greatly during the Jurassic Period. In the seas, there were more and more invertebrate species. Belemnites and ammonites increased and were the most important of the invertebrates during the Jurassic Period. Gastropods, or sea snails, were a mollusk that grew plentiful in the Jurassic period. Corals began to produce reefs in the warm seas. There were many types of bony fishes, sharks and rays swimming in the tropical seas. The seas of the Jurassic Period were filled with predators. The ammonites, belemnites, and fish were all excellent hunters. This may be the reason for some species’ numbers growing fewer. There were not as many brachiopods or crinoids as in the previous periods. These animals, that stayed fixed on the sea floor, could not complete with the moving predators for food. The marine reptiles that had gotten their start during the Triassic Period increased in numbers, too. Ichthyosaurs and plesiosaurs were most plentiful during the Jurassic. They shared the sea with early crocodiles. As the land pulled apart, the seas rose. Warm shallow seas again covered parts of Laurasia (North America and Eurasia). With the warm seas touching the land, the climate became more humid and tropical. Plants grew thick and tall. There were so many cycads that the Jurassic is also known as the Age of Cycads. Cycads are a seed plant with leaves that look like palms. They have heavy trunks. Cycads still exist in modern times, but they are not as large or as plentiful as the ones that lived during the Jurassic Period. All of this plant life fed the many different types of herbivorous dinosaurs that developed. Of course lots of herbivores means good eating for the carnivores. So many different types of dinosaurs lived during this period that it is known as the Age of the Dinosaurs. There are many misunderstandings about dinosaurs. Movies and TV have led us to believe many things that aren’t really true about how and when dinosaurs lived. For example, the movie Jurassic Park included Tyrannosaurus Rex and Velociraptors as some of the “star” dinosaurs. In fact, neither T-Rex nor Velociraptors existed until long after the Jurassic Period was over. The largest dinosaurs during the Jurassic Period were the sauropods. These dinosaurs stood on four thick legs. They had long necks and long tails to help give them balance. Some of these sauropods were gigantic. Brachiosaurus weighed about 55 tons! Diplodocus was the longest sauropod. It could grow to be 45 feet long! The Theropods walked on two legs and were carnivorous. They were vicious meat-eaters. 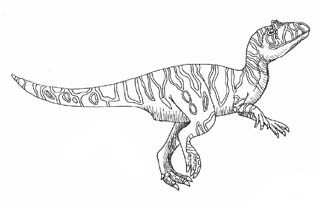 Allosaurus was a Jurassic theropod. Allosaurus grew to be 35 feet tall. It had a thick tail which helped it balance on its hind legs. The front legs were very short, but each “hand” had long sharp claws. The allosaurus feet had three long toes with talons like an eagle. This dinosaur was a fierce predator! All dinosaurs were not carnivorous. Many ate only plants. These were the herbivores or herbivorous dinosaurs. 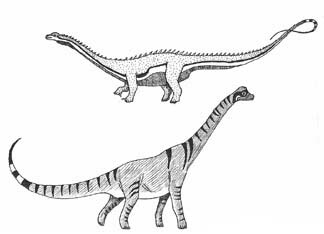 The huge sauropods were herbivores. Stegosaurus was also an herbivorous, plant-eating, dinosaur. It had plates in two long rows along its back. Although it looks a little like a sauropod, it belongs to another group, the ornithopods. The ornithopods had a hip structure more like that of modern birds. All ornithopods were plant-eaters. Bird like Dinosaurs or Dinosaur like Birds? The first bird-like species developed during the Jurassic. Archaeopteryx is a well-known example of a link between dinosaurs and birds. Archaeopteryx had some characteristics of the dinosaurs like a long tail, and finger claws. It also had some characteristics of modern birds like feathers. In recent times many fossils have been found with both dinosaur and bird characteristics. Confuciusornus is one found in China. Some raptor species have been found with clear feather imprints. Most paleontologists today consider birds to be closely related to the dinosaurs. The Archaeopteryx may not have been the first dinosaur to have feathers. But it did cause scientists to rethink the definition of birds. Mammals continued through the Jurassic Period. They remained small. Many different species developed, but the mammals were still not playing a large part in the day-to-day life of the Jurassic. That was all about the dinosaurs!